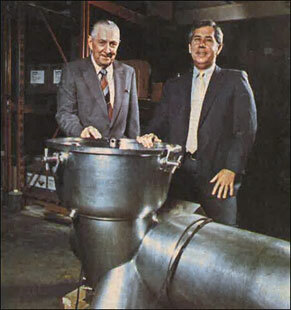 Since 1885, we have remained a family-owned company. We are home to a group of associates who care about our company’s health, our customer’s needs, our community’s interests and each other. We are a vibrant and growing company – utlilizing innovative ideas and technologies to help our customers grow for the future while maintaining the philosophy to treat our associates and customers like it is 1885. In May 2015, M.G. Newell celebrated its 130 year anniversary. Join us in following our steps through history….. In 2008, M.G. Newell took another step forward in its growth. 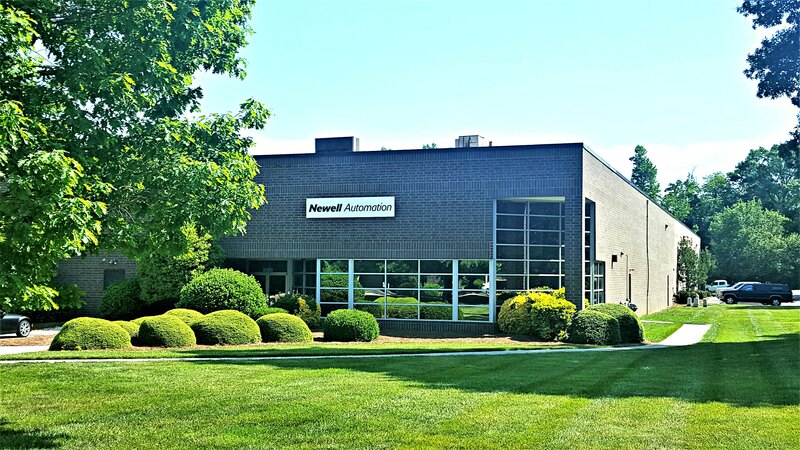 A new segment – Newell Automation – was formed. Newell Automation, now under the leadership of Carlton Davenport, consists of a team of controls engineers, electricians and calibration technicians. Their focus is to develop software and hardware controls systems for customers in the sanitary processing market. Specialties include control panel design and fabrication, automation hardware, HMI design and programming, PLC design and programing and software audits and retrofits. In January 2018, our Automation group moved into its own building in Greensboro, NC – just across the street from our Greensboro and Corporate office. In the summer of 2012, M.G. Newell took another step forward in its growth. Under the direction of Vic Davis, a new office was opened in Hendersonville, Tennessee, a suburb of Nashville. This office, initially supported with inside sales and technical service, enabled us to better service our customers in western Tennessee, northern Alabama and northern Mississippi. It quickly grew to include additional inside and outside sales support, engineering services and warehousing capability. This newest M.G. Newell team continues the tradition of providing expert solutions for sanitary processing. After five moves during our first century business, M.G. Newell moved to our current location on Citation Court in 1996. This office houses our corporate office, our Greensboro division, our main distribution warehouse and our fabrication shop. It was at this location where we survived Y2K, or our second turn of a century! Our Louisville division still resides at the Bishop Lane location where we started in 1994. Today, M.G. Newell Corporation is home to a group of associates who care about our company’s health, our customer’s needs and our community’s interests. We are a dynamic and futuristic company where we push technology to the limit yet treat its associates and its customers like it is 1885. That is 125 years of building relationships and making it work better. With the right partner, anything is possible. We want to thank all the “partners,” both past and present that have helped shape M.G. Newell into who we are today. This would be a decade of growth through acquisitions and territory expansion. In 1987, M.G. Newell Company purchased Food Equipment and Supply Company in Tampa, FL. This purchase opened up deeper relationships into the state of Florida and afforded us opportunities in the Caribbean, Mexico and Central America. The Tampa Division of M.G. Newell, which it would later be named, focused primarily in the citrus, food and beverage industries. Our Tampa division was originally managed by Joe Hayes, who had joined Newell shortly before the acquisition. On March 1, 1994, M.G. Newell opened an office in Louisville, KY. David Brink was hired to lead this new office that would cover Kentucky, Tennessee, Ohio and Indiana. He began with a Director of Engineering and an administrative assistant to assist him in this new endeavor. Within 10 years of the new leadership at M.G. 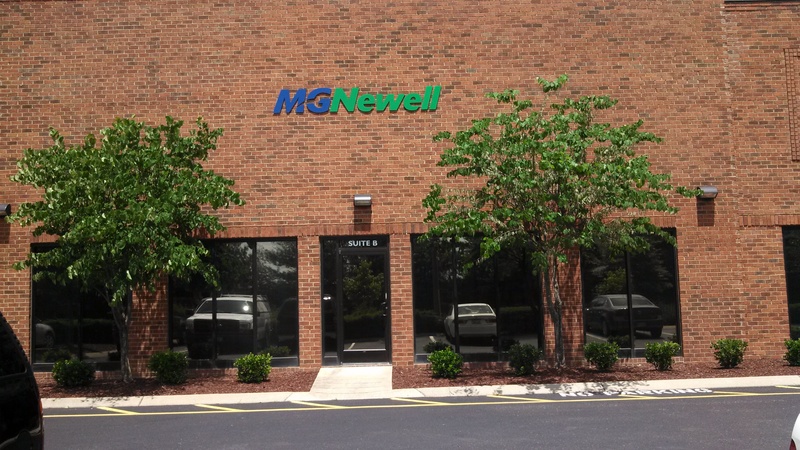 Newell, we had transformed into a business with three divisions: Greensboro, NC, Tampa, FL and Louisville, KY. Now formally M.G. Newell Corporation, our distribution and systems integration services were continuing to grow and our sales were at an all time high. One last move was to follow. During this time, our movement into systems integration occurred. With the hiring of Tom Johnson, we began to provide other services. Our capabilities included design, fabrication and installation of sanitary process systems. We covered the entire southeastern United States which included the greater Miami metro area where we designed and installed an HTST that tripled the plants volume overnight! Our first big project outside the dairy industry took place at a beverage plant. We were now at the true beginning of who we are today. Our sales had eclipsed 10 million and we had 26 full-time employees by the end of this decade. However, the last Newell had retired! In 1982, Buddy Newell called it a career. With this transformation and with no more Newell’s that desired to be in the business, M.G. Newell Company was sold. Tom Johnson and Jack Fleming joined John and Sally Sherrill in purchasing the business from the Newell’s on December 1, 1984. With new leadership, there would be new direction. During Hase Smith’s leadership, M.G. Newell Company, Incorporated began another growth phase. This growth came by diversification. Dairy was not the only industry we served any longer. Beverage, food and personal care plants began to fill our customer list. We now were stocking equipment and supplies for all types of sanitary processing. Additional to our distribution services, we were now becoming a resource for installation and integration services. Our welders were capable of hooking up pumps, tanks and other capital equipment. We did small installations throughout the mid-Atlantic and southeast. We were on to something and were preparing ourselves for growth and expansion. On June 15, 1955, one LaReeta Stanley Hanner joined M.G. Newell Company, Incorporated and worked for us until December 2010 – 55 years of service! LaReeta started with us while in our Davie Street location. However, after almost 40 years on Davie Street, M.G. 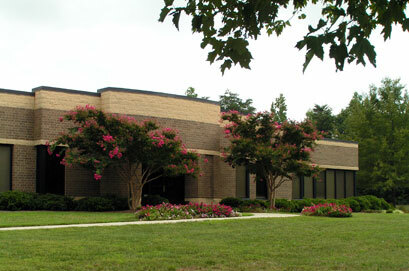 Newell built a brand new building and moved to the east side of Greensboro. Our new address was 200 Raleigh Street and we were now up to a seven digit phone number! We even received our first zip code. (The zip code, which stood for “Zoning Improvement Plan,” was introduced by the US Post Office on July 1, 1963.) The move to our state of the art facility was the same year we celebrated our 75th anniversary. After only a couple of years, in order to handle the ice cream and novelty ingredients growth, we made a warehouse addition. Overseeing this period of growth was Hase Smith. He became president of the company in 1960 and would lead the company into the next big change for M.G. Newell Company, Incorporated. In 1946, a new company founded by former officers of M.G. Newell, split off the implements business and named it Baldwin-Garrett Company. This business was now separate from M.G. Newell Company and afforded us the opportunity to focus solely on the dairy industry. Our slogan then was, “Machinery and Supplies for the Milk and Ice Cream Industries.” We are the south’s oldest dairy supply company. Bulkan (3 gallon bulk ice cream containers) sales were a major part of our distribution efforts selling about 80% of the market to the Carolinas. Stainless steel sanitary process components were now filling our shelves. During this time, we also hired a gentleman named Jack Fleming, Sr. He would later become our third employee whose tenure endured 50 years of service! He also participated in the first HTST installation in the southeast at North Carolina State University’s dairy. We are honored to still have them as a customer today. We also started a tradition that has lasted to this day…M.G. Newell 3-month calendars…you would be amazed how many customers (even retired) call and ask for these calendars. On September 21, 1936, Myron Gilbert Newell passed away. 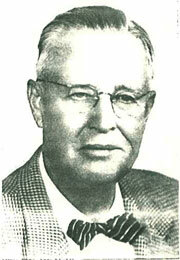 Upon his death, the leadership passed on to his son, Burton M. Newell. Our sales that year were $329, 302 with a gross profit of $80,746. These sales included our “implements” business and our new growth into the dairy industry. Within four years we had grown another 30%! We were aligning ourselves with some of the most recognized names in the industry: Cherry-Burrell, de Laval, Girton Manufacturing and Damrow. Our phone number had finally reached five digits (2-0155)! In 1925, M.G. Newell Company came to the crossroads of business again. It was another big decision by Newell. However, this time it was Myron’s son, Burton M. Newell, who made the decision to take the company into the dairy industry and away from “dry goods and notions.” There was a lot of resistance to Burton’s idea so he hit the road selling! This turned out to be a pretty good idea. By the early 30’s dairy plants were buying pasteurizers, cooling equipment and automated washers from us. If you called us (our phone number was now up to four digits!) 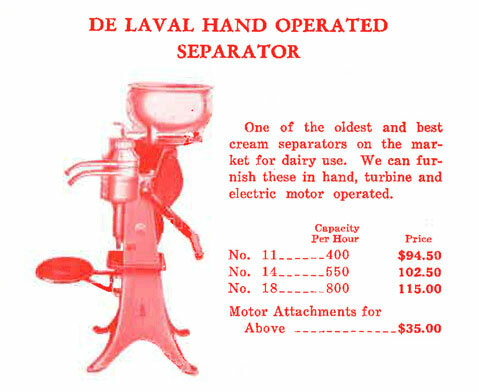 for a separator, the 800 pound per hour De Laval hand operated separator sold for $115.00…if you could last that long cranking it! Where did we go from there? M.G. Newell Company moved, for the fourth time, around the corner to a new location on Davie Street. Two side-by-side buildings were purchased to handle expected growth. Little did we know that the new site would become a historic building in downtown Greensboro about 70 years later. It only took four years almost to the day, May 5, 1908, for Myron G. Newell to purchase the business back from Petty-Reid and incorporate the company. Oddly enough, he came in with his mentor, Mr. R.G. Campbell, whom he named president while he was secretary and general manager. Campbell honed his skills at the big cotton mills in Greensboro named White Oak, Proximity and Revolution (Cone Mills…mills under the Cone family that produced denim, corduroy, and other fabrics sold to Levi Strauss and Blue Bell (Wrangler) brands among others). Later that year the Greensboro Daily News was calling M.G. Newell Company, Incorporated “one of the reliable houses who have increased their business by handling high class goods.” They commented “those who are wise do their trading with the house of M.G. Newell.” We sure are glad that Newell bought the business back! If you wanted to place an order of high class goods by phone, just call us at phone number 158. As we continued to evolve, another big decision by Newell came in 1912. 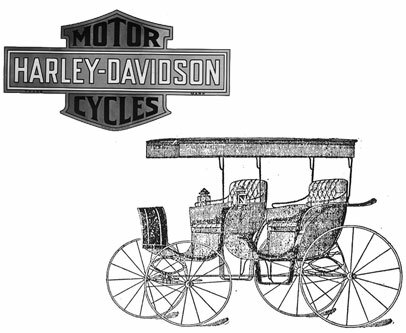 Adding to our line of buggies and bicycles, Newell signed on to be a dealer for a new “bike” out on the market. The name of this “bike” was Harley-Davidson! Can you hear that thunder rolling down S. Elm Street? If you wanted a single cylinder engine motorcycle from us then, the list price was $200.00. So let’s recap. Over this decade we have associated ourselves with two of America’s historic companies: Harley-Davidson and Cone Mills. Where would we go from here? Myron Newell married the former Miss Minnie B. Rankin on Christmas Day in 1897. After almost 20 years in business, M.G. Newell appeared to be getting claustrophobia! Apparently his “health broke down on the account of close confinement.” He needed to get away from the business and get out into the “open air.” So in 1904, he sold the business to Petty-Reid Company, and went on his way. The name remained the same, however, and it was still the desired destination for all those traveling to town to secure their implements, bikes, harnesses and supplies. 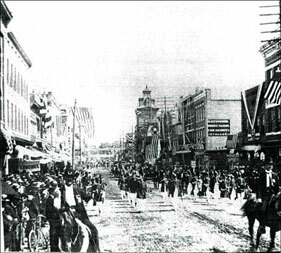 In 1885, on the corner of Asheboro Street and Bragg Street, Myron Gilbert Newell opened his first business. He named it South Side Grocery Store. 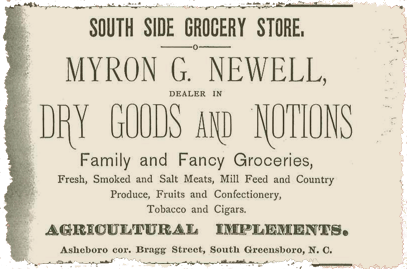 The store sold everything from ‘fresh, smoked and salt meats,” and “dry goods and notions” to “agricultural implements” and “tobacco and cigars.” After working for Houston Brothers Grocery, Newell ventured out to start a business on his own stating, “Greensboro was a growing city and that business here and the surrounding community would soon be on a large scale.” For his efforts, he paid himself $50.00 a month. In 1892, Newell moved his business to Depot Street and changed the focus of the store…and the name. M.G. 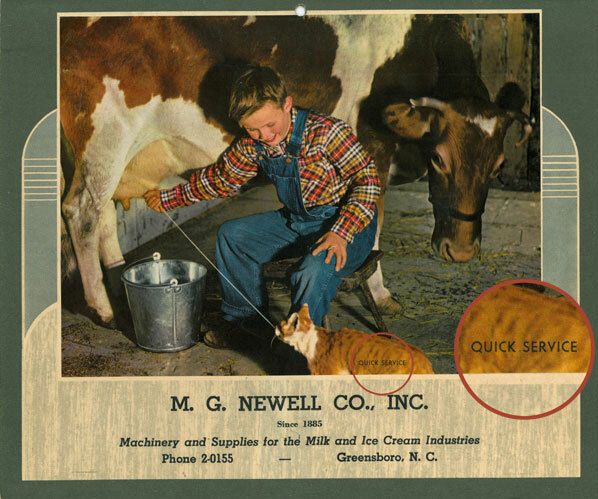 Newell & Company opened with a stock of machinery and supplies catering to the farming industry and more focused on the “agricultural implements” than the “dry goods and notions.” Items such as vehicles, bikes, harnesses, hand churns, pails and a line of “cow remedies” were for sale. This is the first big decision that Newell made in the ever evolving business of M.G. Newell Corporation.